This creamy, Parmesan-topped potato gratin is perfect for a crowd. The crisp cheese crust, browned and crunchy at the edges, is an ideal foil for multiple layers of paper-thin potato slices scented with thyme, nutmeg, and white pepper. The Parmesan sprinkled on each layer adds just the right amount of saltiness, and the garlic-infused cream brings a rustic earthiness to the gratin. 1. 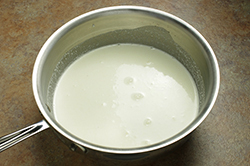 In a small saucepan, combine the cream and garlic over medium heat, bring to a simmer, and simmer for 5 minutes. 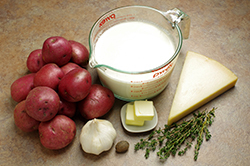 Remove from the heat and let the cream and garlic steep while you prepare the potatoes. 2. Position a rack in the center of the oven and preheat to 325°F/165°C/gas 3. 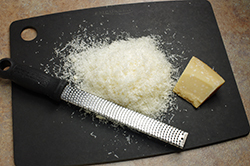 Generously grease a 12- to 14-cup/2.8- to 3.2-L shallow baking dish or gratin dish with the butter. 4. 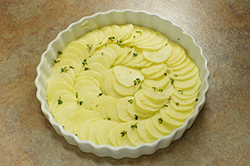 Bake the gratin until the potatoes are almost tender and the liquid is mostly absorbed, about 1-1/2 hours. 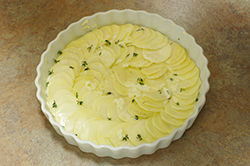 Uncover the gratin and continue to bake until the liquid is completely absorbed and the potatoes are browned and moist, about 30 minutes longer. 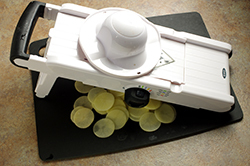 If desired, turn on the broiler and broil until the top is browned and crisp, 2 to 3 minutes, making sure the dish is broiler safe. 5. Set aside to rest for 10 minutes before serving. 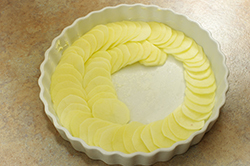 Cut into wedges or squares and serve directly from the dish. 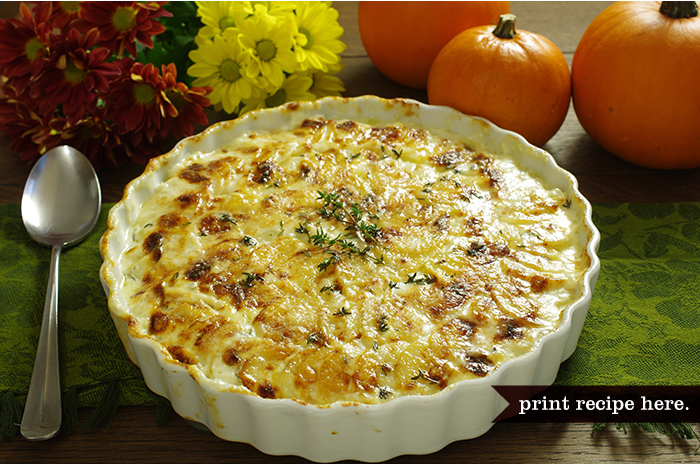 Cook’s Note: You can make this recipe in individual gratin dishes. 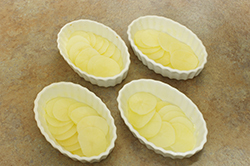 To serve eight, cut the ingredients by one-third and assemble the gratins in eight 5-in/12-cm round white porcelain gratin dishes. Bake for about 45 minutes and then begin to check for doneness.